Please refer to our stock # T 1807 when inquiring. Doubled this would make a nice doll necklace. Bold hand knotted nevada lapis necklace and removable green rutilated quartz pendant both by and signed: Mimi Dee - Sterling. Both pieces were designed and composed in a USA studio. 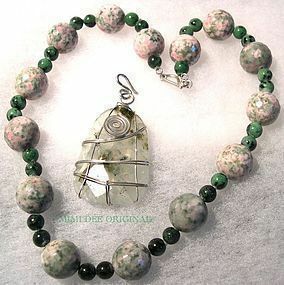 Necklace: 147 grams of 18mm faceted pink and green Nevada Lapis and 8mm Ruby in Zoisite beads to yield a hand knotted 20" strand. while all beads are from faraway lands... all semi precious metal was hand hammered formed shaped and signed by this jewelry artist. No cable to break! Handknotting shows care, provides fluidity and safeguards against loss of beads. It doesn't take an "artist" to run a bunch of beads together on a cable; a bit of hand worked semi precious metal should be included to complete. Removable Pendant: 3" and 29 grams of 50mm X 36mm dreamy green rutilated faceted quartz with a hand wrought marked silver spiral and hook. Both pieces finished with a signed Mimi Dee Sterling hand wrought hook. $12 USPS Priority/Ins/Track or FREE with USA Ck or USPS MO. This signed studio metalwork jewelry artist who also paints oils has made fiber art to wear garments in the past and does not duplicate, has exhibited in various juried shows, more recently since 1990 and at the previously open Methuen studio store gallery by the same name.